The first 250 copies of the Dracula’s Daughter 1936 Ultimate Guide are signed by authors Nige Burton and Jamie Jones, and come with a FREE art print – click here to view the special edition! The Dracula’s Daughter Ultimate Guide is like the brochure you might have bought at the cinema back in 1936, capturing the brooding thrills of the movie! That weird feeling is on the rise again – it can only be our luxurious Ultimate Guide to Dracula’s Daughter! Universal told an all-new vampire tale in 1936 when they created the tragic story of the Countess Marya Zaleska. The eerie, sensual stylings of Dracula’s Daughter brought us a new kind of horror that has enthralled fans for decades, and our Ultimate Guide is the perfect tribute to this hauntingly lyrical melodrama. The lavish full colour presentation and elegant, timeless design of our Dracula’s Daughter magazine guide capture the otherworldly atmosphere of Lambert Hillyer’s intriguing creation, immersing you once more in this classic motion picture. Lovingly restored stills and lobby cards bring the story to life as the insightful journalism for which Classic Monsters is renowned unfolds the story of how the movie came into being. 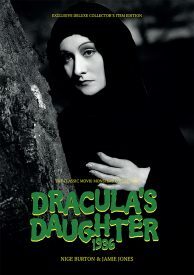 Fact-packed biographies introduce you to the lives and careers of the gifted artisans who toiled both in front of the camera and behind it – no fan of Universal monsters should be without this guide to Dracula’s Daughter. 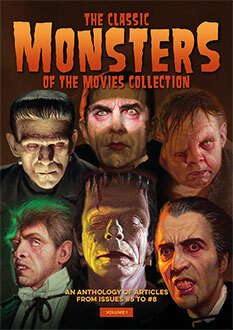 Meticulous attention to detail means that from the high-gloss cover to the final stunning release poster reproduction and premium quality printing, this is an unmissable addition to your Classic Monsters magazine collection. The first 250 copies of our Dracula’s Daughter Ultimate Guide are signed by authors Nige Burton and Jamie Jones, and include this exclusive FREE collector’s item limited edition art print. This is not available anywhere else and can only be obtained with one of the first 250 copies of the Dracula’s Daughter Ultimate Guide. Click here to view the special signed edition with the art print! Please note, the Dracula’s Daughter guide is limited to 1000 copies worldwide, including the 250 signed copies with the free art print.